how do you tell if it's a Greco Super Real or not? Did they make Super Real in 1982? What is the difference between a Super Real and Mint collection? Super Real was in 1980 to 1981 only. Mint Collection was from 1982 to 1989 (maybe until 1990). Best years to get are 82 to 85 they say for quality. The differences are the details of the Instruments, Names given to them (EGF1000 vs EG58-120), some construction i believe in the Les Pauls are slightly different. What is the same is the serial numbers. 1980 goes 0 XXXX all the way up to 1989 which is 9 XXXX. Again it might repeat itself in 1990 with the 0 XXXX but i dont know for sure. hi, thanks for the reply. how do i then identify and verify the authenticity of a Mint Collection? hum, Harmony central reviews are difficult to rely on. 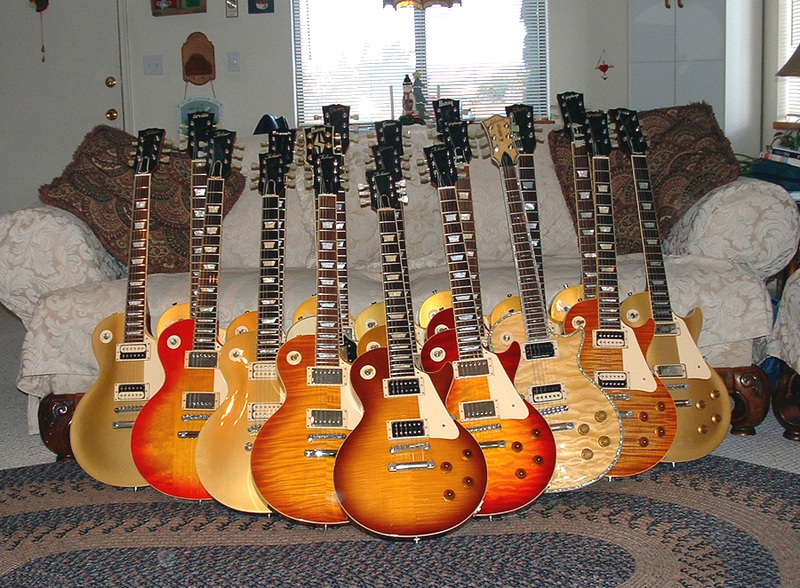 No matter what brand, it allways end up with "definitely a bang for the buck, the quality of a Gibson for cheaper. etc..."
Wonder if people are deaf or if they try to fool themselves. Harmony Central reviews must be viewed with some caution. If the reviewer says "I just got it" then he's still in the bliss filled "honeymoon stage" of ownership. I look for guys that have been playing a long time, maybe in a regularly working band, where the instrument is getting a real workout. Most people won't come right out and say "Man I screwed up buying this POS", well except when it comes to Ed Roman gutiars. LOL. But they are good to distinguish what people paid (and when), features and hopefully the subtle cosmetic differences. I've also seen my share of situations where the reviewer posted his review under the wrong model number - but that's pretty easy to spot if there are say 8 or 9 reviews of the same model. Most people won't come right out and say "Man I screwed up buying this POS", well except when it comes to Ed Roman gutiars. LOL. see the ones on my site for examples..
hey guys, ive been looking at this Greco for a long time, its quite interesting, i've not seen a similar one on the internet. have u seen it before? It's a common greco from the start of the 70's. Nothing special about it. Might have a chambered body. It can be a good guitar but don't expect a perfect copycat like the mint collection or the super real as it has the big head like all early Greco have. They are also a bit heavy on the finish. But it's good guitars made with good materials. The PU are really nice. Truss rod cover is obviously gone. I have a late 70s SE-800 and love it. Great guitar in every way. Also have 2 SE-600s, one that was butchered by somebody to be a Jeff Beck model...but it too sounds great so I kept it. I really like those older Greco strats and am looking for a Fernendes from that era. Posted: Sun May 14, 2006 11:15 am Post subject: GRECO SE 500 STRAT-HOW'D I DO? ACTUALLY THE SELLER LET ME HAVE IT FOR THE OPENING BID PRICE+SHIPPING WHICH CAME TO $460.00 usd. IT HAS A FLAW IN THE FINISH BUT WHEN I'M PLUGGED IN WHO CARES. WHEN I PLAY IT THE FIRST TIME AM I GONNA SAY TO MYSELF, "I COULDN'T HAVE BOUGHT A FENDER THIS NICE FOR $460"? FROM WHAT I'VE READ I FIGURED THIS WOULD BE THE CLOSEST THING TO PLAYING A VINTAGE FENDER I'LL EVER GET. THE AMERICAN GUITARS IN MY SMALL COLLECTION SEEM TO BE SLOWLY GETTING PUSHED OUT BY THESE GUITARS. I RECENTLY SOLD 2 GUITARS AND BOUGHT A LOVE ROCK. IT'S A SHAME BUT YOU CAN'T ARGUE WITH THE QUALITY AND PRICE. THANKS FOR ANY INPUT.